Bank that holiday and make it count! “Summer time and the living is easy, fish are jumping and the cotton is high”, the immortal words of summer. Or as the August bank holiday is upon us you could say something a little more like “Summer time and the traffic is heavy, kids are screaming and the end is nigh”. So onto visiting a family event at the RSPB’s headquarters at The Lodge. This time the theme was ‘Nature Discovery’. The 2 hour event was run by 3 fantastically organised and knowledgeable volunteers. 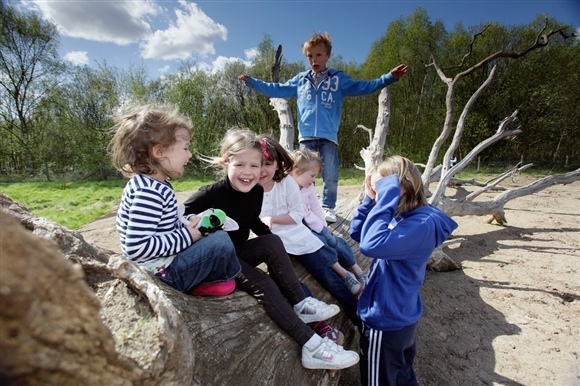 Families were split into 2 groups and were lead round part of the reserve to discover nature. Being office based I find it important to make time to get out and walk the ground with our wardening teams and find out a little more about their work managing some amazing landscapes for wildlife. So last Monday morning found me at a sunny Ouse Washes to meet our Site Manager Jon Reeves and Richard Woollard my counterpart at the Environment Agency. When was the last time you made a den? A Gooses egg or Geese eggs? On the very rare occasion that the office based administrators have some spare time, they go and sit in our reception, that’s the place to be to find out what’s really going on. Last Friday saw me at one of Fen Drayton’s family events. I arrived feeling very good about my carbon footprint, having got there by train and the shiny new Guided Busway! The bus stops on the doorstep of the reserve so no excuses for not going for a visit to this beautiful part of the world. What can we do about the riots? This week, I’ve been working on an incredible RSPB project. Our Minsmere reserve is having a bit of a make-over and in the new year we will have a fantastic, dedicated learning centre for youngsters and families to come and be inspired about nature. Excited to study Geology/Earth Sciences at University in 2012, I applied for the Nuffield Science Bursary and waited anxiously for the letter of acceptance. I was thrilled to discover that I had a 4 week placement with the regional RSPB office in Norwich. Imagine my delight the other morning, opening my bedroom curtains and seeing a fox sunning himself in the flowerbed, not a care in the world. He stayed for about half an hour lazily grooming himself and then had a quick nap before strolling off. So my journey around the region investigating family events continues. This week I have visited Titchwell and Frampton – different activities and very different weather conditions, but both engaging with loads of families. I'm gutted. Wagon wheels don't have jam in them anymore. What's occurin'!? In the good ol' days that fake Wheely jam sat tenderly against its pure white mallow like a jumped up jammie dodger. But then in the good ol' days corncrakes croaked from the fields, corn buntings jangled from ripening corn and hedgerows were bursting with wild flowers. The RSPB Eastern England membership team visits all manner of public events over the summer as we spread the word about the fine work of the RSPB, but the event I was most looking forward to attending this summer was the Cambridge folk festival, which took place last week at Cherry Hinton hall near Cambridge. I have to say the weekend exceeded my expectations.